Best Framing Nailer Review and Shootout - Head to Head Results! Finding the best framing nailer for your work means different things to different Pros. Are you a framer or a remodeler? Is price the biggest issue, or is it driving power, weight, or recoil? No matter what your priorities, chances are our Pro team has considered it in this head to head shootout. Of course, we put our heads together to take this comprehensive list and rank each model at the end. As a bonus, we brought in 4 models that don’t require a hose. Buckle your seatbelt – here we go! Editor’s Note: Hitachi’s NR90AE(S1) didn’t make in time for our initial tests, but it arrived and we have updated the results to reflect its performance. The shootout was originally published on June 25, 2018. There are features, but some make a bigger impact than others. Here’s what our team looks for and which models have them. This one is pretty obvious inclusion and it shows – every model we tested except the Hitachi NR90AE(S1) includes a rafter hook. Some are better than others, but most are pretty standard. The Hitachi 18V hook is big enough to straddle a 4 x4 – and get in the way. Hitachi’s NR83A5 doesn’t swivel while Estwing’s swings freely. Plastic magazines tend to work more sluggishly than the crisp action of a good metal magazine. All of our pneumatic framing nailers have metal magazines and all of the cordless models have plastic. As the nailer fires, exhaust has to go somewhere. Most Pros prefer to turn the exhaust port away from their faces to avoid have that quick blast of air deliver a small particle into their eyes. In the best case scenario, you flip a switch to change between single fire and bump fire modes. Some of our nailers make it that easy. Some have a two-step process for safety reasons, but a couple require a complete trigger change – something our team hates. 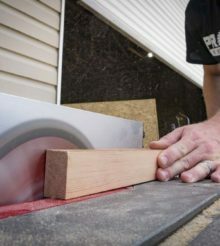 Dry fire lockout helps prevent damage to the driver blade and reminds you to add more nails before you a run a line without nailing anything. In an ideal world, lockout would happen once the last nail is fired, but even the best framing nailer leaves a few in the magazine. Editor’s Note: We originally reported that Estwing does not have dry fire lockout when, in fact, it does. Not having a hose to drag around is a huge advantage for cordless/hoseless nailers. There are some trade-offs like weight and capacity, but they’re worth making for remodelers and punch list work. Now throw out all nailers that won’t take 3 1/2″ .131. Why did you not include the Max framing nailer in the comparison test? Surely a worthwhile competitor? I wonder why didn’t Milwaukee Cordless model make the list?